Lots of snow fell across New England Thursday, leaving thousands of people in the dark. The biggest storm to hit the Northeast this winter dropped more than a foot of snow in Greater Boston on Thursday, turning roads treacherous, grounding flights and giving millions of people weather whiplash a day after temperatures soared into the 50s and 60s. The snow began to fall in western Massachusetts around 5 a.m. and had reached the Greater Boston area by 7 a.m. Hundreds of area schools called off classes for the day, and Boston and many other cities and towns canceled school on Friday as well. Blizzard Warnings were issued for the Greater Boston area, along with the Cape, Islands, North Shore, South Shore and parts of Rhode Island and Connecticut. A blizzard was officially verified in Boston, Hyannis, Marshfield and New Bedford, Massachusetts and parts of Connecticut and Rhode Island. The Boston area saw 14 inches of snow, though more than a foot and a half fell in other areas of New England. More than 50,000 Massachusetts customers were without power at one point. At 11 p.m., more than 39,000 households in the state remained in the dark — more than 25,000 of them on Cape Cod. At times, snowfall rates exceeded 2 to 3 inches per hour across southeast Massachusetts. Both Connecticut and Rhode Island got "thundersnow," with whiteout conditions accompanied by the rumble of thunder. A snow emergency will remain in effect in Boston until 8 a.m. Friday, and no space savers are allowed. State offices in Massachusetts closed Thursday for non-emergency, executive branch state employees, but they will reopen on Friday. "We expect the roads to be in better shape, but everyone should drive carefully and take their time, because there will still be icy spots out there tomorrow morning," Massachusetts Gov. Charlie Baker said. Simon Malls closed 18 of its malls and outlets in Massachusetts, New Hampshire and Maine, including the Northshore Mall, the Burlington Mall, the Square One Mall, the South Shore Plaza and the Wrentham Village Premium Outlets. The MBTA and the Amtrak Downeaster operated on a regular schedule. Some delays were reported, but there were no major problems due to the storm. More than 700 flights were canceled at Logan International Airport. Passengers planning to travel from Logan should confirm their flight status with the airline before leaving for the airport or check the flight status on the Logan website. State officials urged residents to stay off the roads if at all possible to allow road crews to clear snow, and most people obeyed that warning. Massachusetts State Police responded to a number of crashes and spinouts, but no serious injuries were reported. One tractor trailer in Uxbridge drove straight into the median because the driver couldn't see the road due to whiteout conditions. Stretches of Interstate 95 in Rhode Island were closed in the afternoon after tractor-trailers got stuck. And a vehicle drove right into a house in Pelham, New Hampshire earlier in the day. Almost 6,000 Massachusetts snow crews were out preparing for the storm, but it was hard to keep up and there is still considerable snow on the roads. Crews are expected to be out overnight clearing roads and MBTA tracks of snow. The coastal flood threat from this storm was minimal, but Baker said there was some splashover at high tide Thursday morning. Winds will turn to the northwest as the storm moves away in the evening, pushing the water away from the coast. In Portsmouth, New Hampshire, about 100 people turned out for a snowball fight. Organizer Andrew Bagley said that while there was snow aplenty, it wasn't ideal for snowball making. 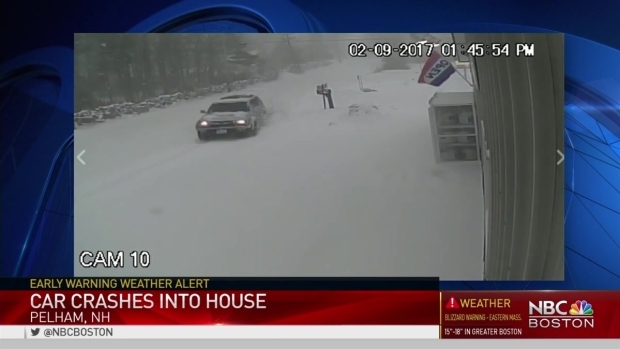 A car crashed into a house Thursday in Pelham, New Hampshire, as heavy snow hammered the region. "It's just an unsanctioned, family-ish event for people staying home on a snow day," he said. "It's an excuse to come downtown and act like little kids again." The storm is now moving out to sea and the snow is already beginning to tail off in most areas. But heavy wind gusts will still result in widespread snowdrifts and some whiteout conditions. Overnight, wind chills are expected to dip below zero. Drifting snow will also continue to be an issue as the winds continue to gust at least 30 to 40 mph. Snowfall Totals: How Much Did Your Town Get? "Temperatures are beginning to fall, and it will get very cold this evening," Baker said. He said those cold temperatures will be a challenge for the MBTA and the commuter rail on Friday morning.